Since the beginning, Total Customer Satisfaction has been the focal point of the company’s operation. This is achieved by strictly complying with nationally and internationally published standards by the Bureau of Product Standards (BPS), Institute of Integrated Electrical Engineers (IIEE), Underwriters Laboratory (UL) and the American Society for Testing and Materials (ASTM). To further boost customers’ confidence in CWCC’s products, a Quality System compliant with the ISO9001:2000 has been established and is continually improved and maintained. With the present status of the company’s business operation, its volume of activities and complexity of systems, coupled with the thrust of globalization, the management realized the need for continual improvement to meet customers’ requirements and to achieve international recognition for it. The management believes that the key to success in today’s market, both local and global, effective management of quality. The management therefore established a new Quality Management System that is compliant with the ISO 9001:2000, and is documented in the company’s Quality Manual. 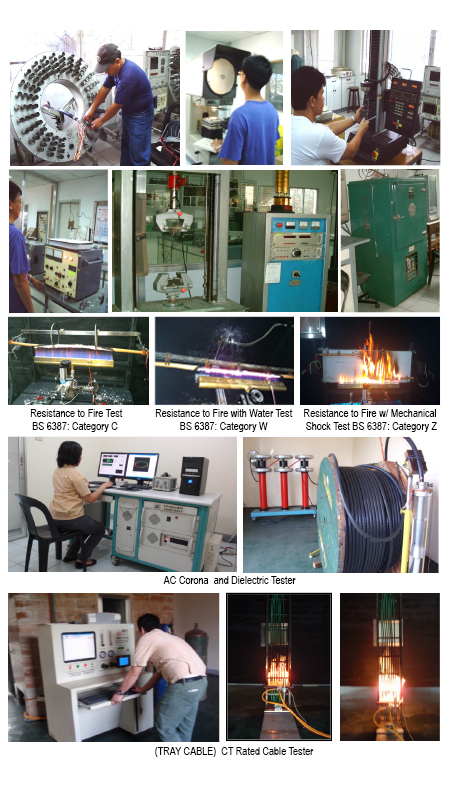 Below are some of the equipments we use to ensure that all our products are 100% Quality Guaranteed.